Some of you may know that I recently remodeled my kitchen. During the 4 week renovation, I ate out, A LOT! In my quest to get my waist line back in check, I challenged myself to a two week, healthy eating challenge. 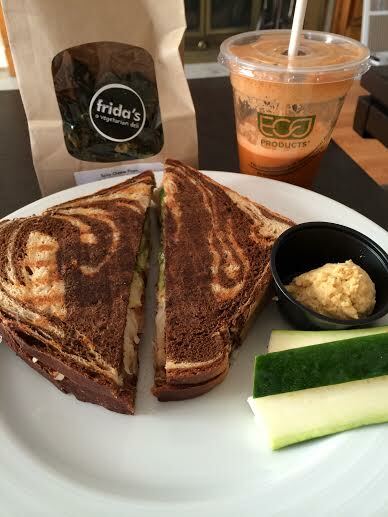 In order to satisfy my goals and my desire to blog, I chose Frida’s Deli in University City as my pick for the week. I will preface my review by saying that this is not the first time I have been to Frida’s. In fact, as a vegetarian living in U City, I was one of the first people in line when I heard that there was a vegetarian restaurant just blocks from my doorstep. However, I was less than thrilled with my first experience and it took me about a year and a half to come back. Nevertheless, I returned with an open mind and I could not have been happier about my experience. 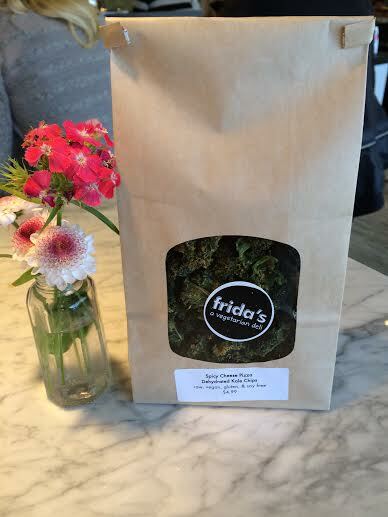 With a space that has more than doubled in size, menu items that have been refined, and service that has had a chance to get the kinks worked out, Frida’s has turned into a place where I can see myself being a regular customer. Don’t let the idea of a vegetarian restaurant scare you. While they do serve some meat substitutes, they also serve great dishes that involve no meat at all such as falafel wraps and Caprese salad. This restaurant is all about options and most meals can be customized for those wishing to eat clean, raw, avoid gluten, or go vegan. Food is purchased from local shops and is organic whenever possible. I started my meal off with fresh juice where you have the option to choose a menu item or develop your own creation. 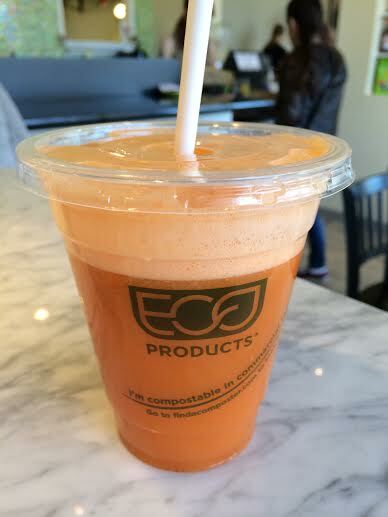 I chose Sweet Zinger juice made from apples, carrots, and ginger which was delicious and had a spicy kick. I then ordered the Mushroom Reuben sandwich. You may be asking yourself, how does a vegetarian get away with ordering a Reuben? Well this sandwich is made with mushrooms, Swiss cheese, avocado, tomato, sauerkraut, and Thousand Island dressing, all between two pieces of grilled pumpernickel bread. The sandwich was served with a side of hummus and sliced, raw zucchini. The zucchini had a very mild flavor and soft texture which was a nice variation to raw veggies that are more commonly served. I also added a side of the spicy cheese pizza kale chips which were really flavorful and felt more substantial than what I’ve ever been able to make at home. After my second experience, I’d definitely return to Frida’s and recommend it to anyone looking for a new spot in the area. It gets a bit crowded at lunch time but I think that just means that they are on to something good, right?